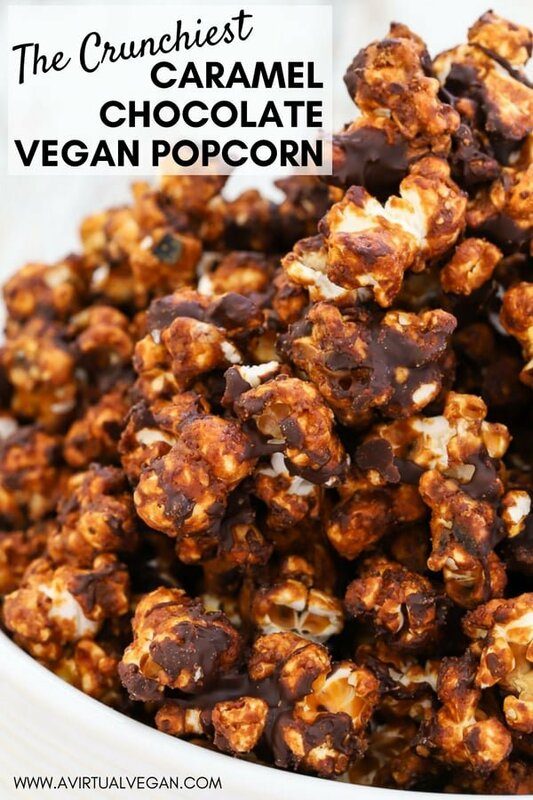 This Caramel Chocolate Vegan Popcorn is seriously addictive. Drenched in rich, buttery salted caramel, baked until perfectly crisp & then finished with lashings of chocolate, it is totally & utterly delicious & absolutely dairy free! Truth be told, I’m not the biggest popcorn lover, especially the kind you buy at the movie theatre. To me it’s like eating buttery, salted cardboard and the smell of it makes me cringe. 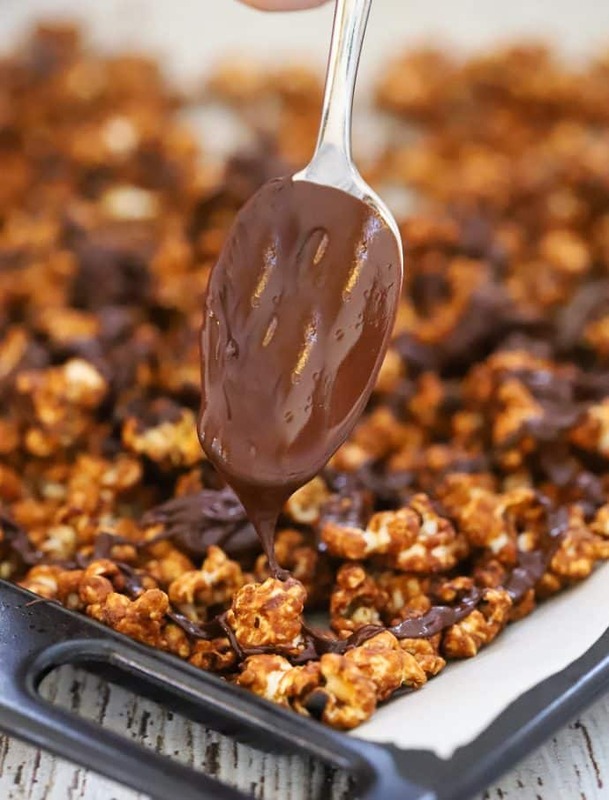 I do like it when I make it myself though, because I can load it up with yummy flavours like I have with this Caramel Chocolate Vegan Popcorn and I have a special trick for making it super crispy too! Am I in the minority with the movie theatre popcorn thing? I guess I am judging by the line-up before each show, but, even if you do like movie theatre popcorn, you’re going to love this too in a whole other kind of way! As you know by now, I am all about flavour. Everything I eat has to be packed with it, otherwise what’s the point? 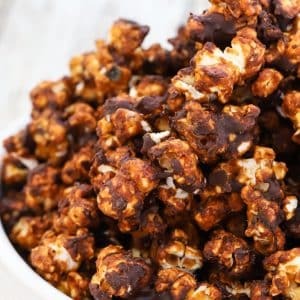 So to make my popcorn taste amazing, I drench it in my very popular, and really flavourful Five Minute Vegan Caramel Sauce recipe. If you have made that recipe then you know how yummy it is! Then comes the secret step that turns it from soggy cardboard to crunchy deliciousness. I’ll let you in on how that’s done in my step by step direction below. The fun part..Pop the corn. There’s just something about the corn kernels popping that makes me smile! Spread out on a lined baking tray then oven bake until super-duper crispy (that’s the secret for transforming the cardboard texture into the crunchiest popcorn you have probably ever eaten! To line your baking sheet, you can use parchment paper or a Silpat. They are non-stick silicone mats and are so handy for lining baking trays. I rarely use parchment paper now unless I need to line the bottom of a cake pan. Nothing sticks to them and they last for ages. I’ve had mine for years. Refrigerate or freeze for a few minutes until the chocolate sets, then break up into clumpy pieces. So there you have it. My trick for making properly crispy, crunchy, vegan popcorn that tastes amazing! It’s perfect for snacking on, serving up at parties and for taking to the movies! Just look at that caramel drenched deliciousness ???? It’s ridiculously good. A batch disappears in minutes here every time I make it! 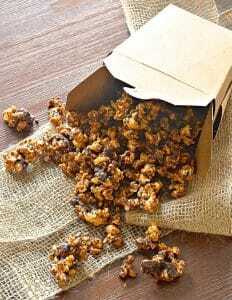 This popcorn is seriously addictive. Drenched in rich, buttery salted caramel, baked until perfectly crisp & then finished with lashings of chocolate, it is totally & utterly delicious & absolutely dairy free! 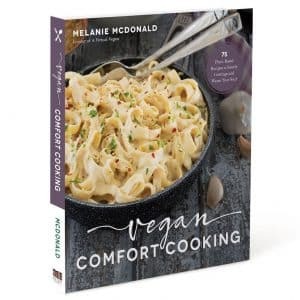 Warm a large heavy bottomed pan with a lid, over medium heat until hot. Pour in the popcorn kernels and put the lid on tightly. Move them around frequently by gently moving the pan. They will start popping after about 30 seconds. Keep watching/listening until the popping stops then remove from the heat but keep the lid on in case a rogue kernel decides to surprise you! Add the coconut sugar and water to a small saucepan and warm over a medium heat until the sugar has dissolved and it is just starting the bubble. Remove from the heat and add the coconut oil, tahini and salt. Stir really well until it is smooth. It is normal to see some pale flecks throughout. If lumps persist or it doesn't combine well put the pan back over a low heat and continue stirring. It will come together. Remove the lid from the popcorn kernels and pour over the caramel. Be careful as it will be very hot. Stir until coated evenly. Pour onto a baking tray lined with either a Silpat or baking parchment and spread out into a single layer. Put in the oven and bake for around 15 minutes until crunchy and golden. 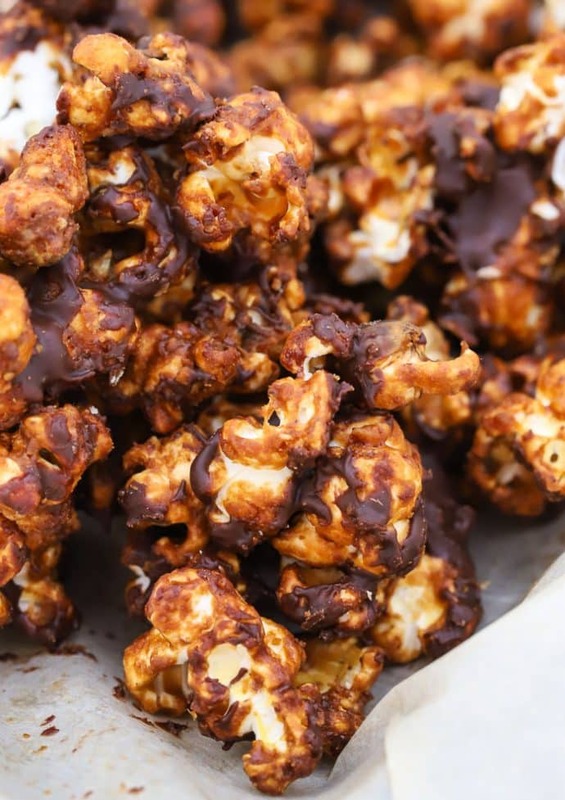 Melt the chocolate chips over simmering water, or gently in a microwave, then drizzle over the popcorn with a spoon. Place the tray in the fridge to allow the chocolate to set. If you are in a hurry you can put it in the freezer for 10 minutes. Once the chocolate is set break into pieces and store in an airtight container where it will keep well for a few days. Feel free to omit the chocolate if you prefer to just have caramel flavour. Took this to a work party today and everyone RAVED about it! So delicious and deceptively healthy! I ran out of coconut sugar mid-recipe so I added maple sugar and organic cane sugar to make up the difference and it turned out a bit lighter in color but still tasted wonderful. Thanks for such a great recipe! That’s awesome Kelly! I’m glad it was a hit. 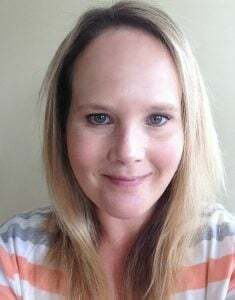 Thanks so muhc for stopping by to leave a comment. I really appreciate it! I just finished baking the popcorn , I replaced the tahini by crunchy natural peanut butter , it’s not your sugary caramel flavored popcorn a healthier version . It came out super crunchy and fresh I was amazed by the texture . I like to eat healthy and this is very good recipe . The coconut palm sugar is not too sweet but if you like sweet you probably would like organic brown sugar or a substitute . Next time I will add 2 more table spoon crunchy peanut butter. 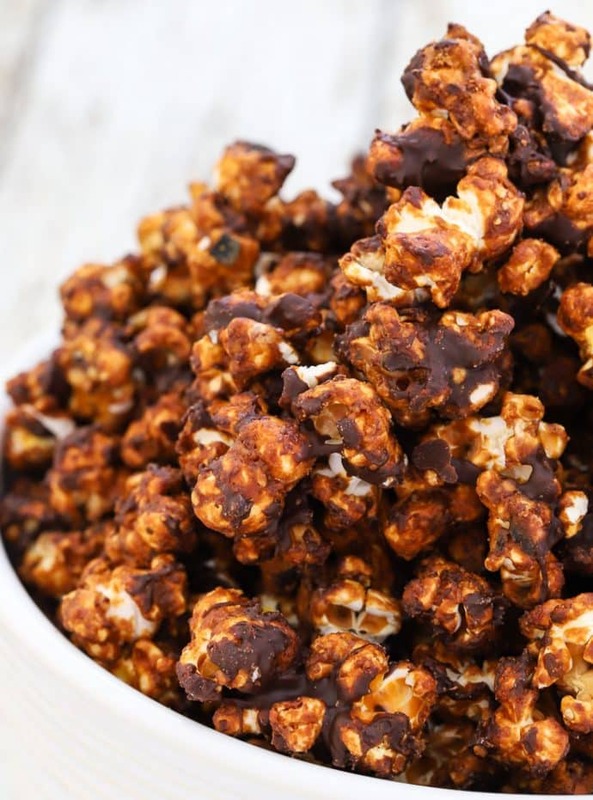 I never looked for making my own sweet popcorn , I bought skinny popcorn and my husband didn’t like it so I transformed it with this recipe. I’ve made this numerous times and had a hankering for it today, so luckily was able to find it again! Yay! Thanks for sharing such a delicious recipe! So pleased you are enjoying it Michelle! This tasted AMAZING!! My caramel wasn’t as brown as yours though….any guesses why? I left in in the oven for almost 20 minutes. Maybe I should’ve left the caramel on the stove longer? 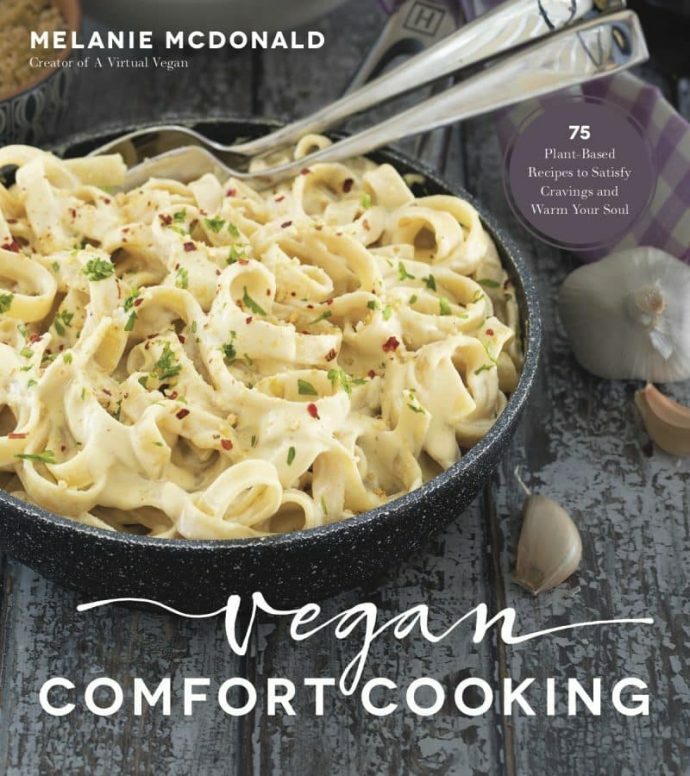 Thanks for all the great recipes!! I’m so glad you enjoyed it Kelly! The colour could be something as simple as my tahini or coconut sugar being a bit darker than yours. Different brands are all a little different. You don’t need to cook the caramel longer. You could always leave the popcorn in the oven a tiny bit longer to make it darker but keep a careful eye because it goes from ok to burnt very quickly. Thank you for stopping by to leave feedback. It’s much appreciated! Lol Anca… I KNOW it’s addictive…. Don’t ask me how many times I have made it! ? This looks amazing, but can I ask – is there going to be any difference if I use unrefined brown sugar (e.g. demerara) instead of coconut sugar? I don’t think I can get my hands on coconut sugar any time soon. Hi Ellie. Thank you! I have never tried it with brown sugar. I am pretty sure that it will work but I can’t guarantee because I have never tried it myself. It might take a little longer for it to melt than I state in the recipe and be extra careful not to stir it at all while it’s melting and before you add the tahini and coconut oil. Just swirl it in the pan. Coconut sugar has a really carameley flavour and brown sugar doesn’t so much so the caramel might not be as to die for, but it will still be good. I think I will try it myself with regular sugar tomorrow then I can amend the recipe to say whether it works or not. If you try it before let me know how it goes! I made this today for the first time with brown sugar instead of coconut sugar and it was delicious, of course I don’t know how it compares though! Thank you for the recipe! Enjoy your movie night! ? Great! Another use for my tahini. It’s so good in this caramel! 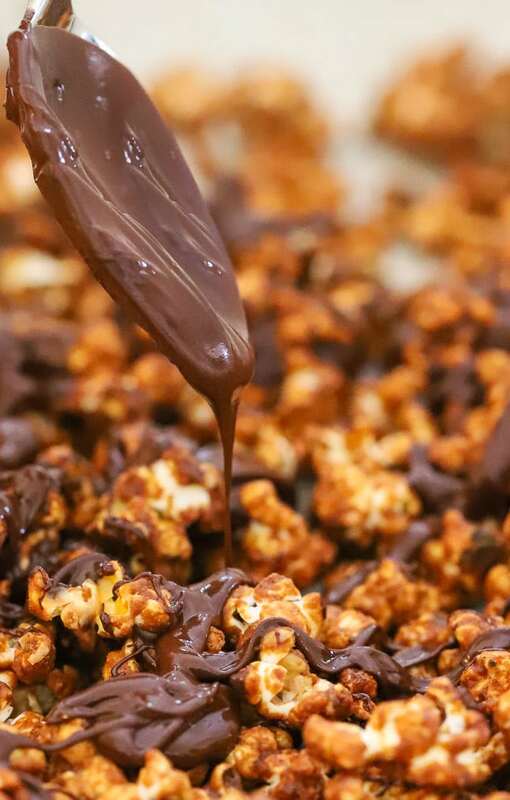 i thought caramel popcorn was great, then you added the chocolate! YUM! Ha ha! Yes it is great but caramel and chocolate is too good a combo to miss! ?